Regional Information Center "CARPATHIANS" » GENERAL GEOLOGICAL OUTLINE OF UKRAINE. TECTONIC SUBDIVISIONS. Within the territory of Eastern-European Platform there are distinguished the following tectonic units: Ukrainian Shield and its slopes, Volyno-Podilska Plate, Prychornomorska and Dniprovsko-Donetska Depressions, south-western limb of Voronezhska anticline. The largest one is Ukrainian Shield which extends from north-west to south-east through entire country. Inside the Shield there are distinguished folded Precambrian basement and overlaying Phanerozoic sedimentary cover of irregular distribution and thickness up to 120 m.
Depending on the extent of erosion there occur the rocks of diverse age (oldest estimated as 3.85 Ga) and composition at present time surface. 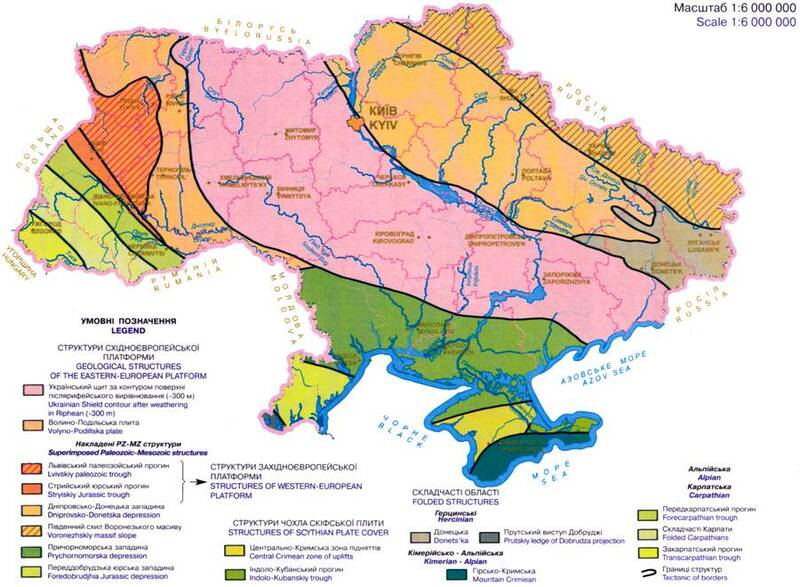 Most of geological landmarks in Ukrainian Shield belong to mineralogy-petrology and geomorphology types. They can be observed along the river valleys and canyons. Close to Zhytomyr city courses the Teteriv River; on the left bank stands Chatskiy Cliff, and granite cliffs Chotyry Braty stand on the right bank. Chatskiy Cliff is 120 m long and 30 m high above the water and looks like iron-dressed knight. Chotyry Braty Cliff comprises four benches that stand like 10-m high giants above Teteriv River course. These and many other landmarks in the Ukrainian Shield have essential perceiving and esthetic value. In the platforms folded rim there are distinguished Herzinian (Folded Donbas, fragment of Northern Dobrudja — Prutskiy ledge in Odesa region, and Marmaroshskiy massif in Trans-Carpathians), Kimmerian and Alpine domains (Mountain Crimea, Folded Carpathians). Ukrainian Carpathians are the portion of Carpathian arc which includes northern branch of European Mediterranean Alpine structures. By folding age Ukrainian Carpathians are subdivided into External (or Flysch) and Internal. They are composed of Cretaceous and Paleogene flysch rocks. Large deep-seated fault (Penninian) separates Carpathians from Trans-Carpathian Internal Trough with the basement composed of Triassic, Jurassic and Cretaceous sedimentary rocks, Paleozoic metamorphic complexes, and the cover comprises Neogene volcano-sedimentary rocks complicated by salt-dome tectonics. Different zones of the Depression are overprinted by Vygorlat-Gutynskiy volcanic ridge composed of Pliocene lava and tuffs. Between folded Carpathians and Volyno-Podillska Plate there is located Fore-Carpathian Marginal Trough which is subdivided into three separate zones: Bilche-Volytska, Sambirska, and Boryslavsko-Pokutska. The first one comprises Pre-Miocene basement buried beneath Sambirska zone which is characterized by folded-faulted tectonics with multi-level tectono-stratigraphic complexes, and Trough sediments including weakly-folded Badenian and Sarmatian (upper molasses) rocks. Sambirska zone consists of system of linear folds and thrusts which form the nappe overthrusted onto autochtonous Trough’s section. The zone is composed of Lower Miocene (lower molasses) rocks. Boryslavsko-Pokutska zone is a large nappe which is overthrusted onto the Cretaceous-Paleogene flysch and is partially overlapped by Carpathian Skybova zone. Geological landmarks of Carpathian region are mainly determined by distinct tectonic forms: shears, stone-falls, water-falls, lakes of different origin, springs, karst and fissure caves, denudation volcanic remnants. Volyno-Podilska Plate and Lvivsko-Volynska Depression are adjoining with Fore-Carpathian Trough. Thickness of the Paleozoic-Mesozoic sedimentary cover of Volyno-Podilska Plate attains 9-10 km. Vednian part of the section is well exposed in the Middle Dnister region. It is studied in details and is considered in publications as unique geological object and etalon of Vendian System. Geological landmarks of this region are related to the stratigraphic subdivisions which cross-section sequentially upgrades from east to west (from Vendian to Devonian), and which are well exposed in canyon-like valleys of Dnister River and its satellites. Especially important are remnants of barrier reef composed of algae limestone (Tovtry and Medobory), gypsum karst caves, and unique, most complete in Europe section of Lower Paleozoic. In the north-east Ukrainian Shield bounds upon Dniprovsko-Donetska Depression (DDD) which is filled with Paleozoic, Mesozoic and Cenozoic sedimentary rocks. There are located stratotypes of Paleogene and Neogene sediments as well as geological landmarks related to salt-dome tectonics. To the south-east from DDD there is Herzinian Folded Donbas. In this region Devonian and Carboniferous sediments are best exposed. Salt, gypsum and carbonate karst occurrences are related to the Permian sediments. Herzinian Folded Dobrudja is located in south-west of Odesa region. There are exposed Devonian and Triassic rocks complicated with thrusts. For geologists it is of interest the section of Devonian sediments on Zmiiniy Island. The high scientific value has paleontological reserve “Odesa katakomby” with accumulation of ancient animal bones. On the territory of Prychornomorska Depression and Scythian Plate there are located stratotypes of different Neogene levels (stages). Region of Kimmerian-Alpine folding (late Mesozoic — early Cenozoic) comprises Mountain Crimea and its eastern buried elongation in Kerch Peninsula. Crimean Mountains are composed of Triassic, Jurassic, Cretaceous, Paleogene, and Neogene rocks. Canyons, quests, exotic cliffs, stone-falls, and karst caves in Crimea are of high scientific and esthetic value. Geological landmarks in Kerch Peninsula comprise mud volcanoes. « GEOLOGICAL LANDMARKS OF UKRAINE. CHERNIVTSI REGION.